Yesterday, the biggest game magazine in Japan, Weekly Famitsu, held an awards ceremony. In the past, Hideo Kojima has attended the Famitsu Awards. This year, he did not. Many other famous creators were on hand to go on stage and receive their awards. Like Level-5’s Akihiro Hino, creator of the incredibly popular Yokai Watch. Square Enix’s Yoshinori Kitase showed off the award Final Fantasy X received. This photo was tweeted out by the Square Enix, who seem proud! Smash Bros. creator Masahiro Sakurai was also honored. Regardless what you think of Famitsu, this is an event that the Japanese game industry luminaries make time for, whether they’re the middle of production or not. Kojima’s absence wouldn’t be that strange if there weren’t strange things going on (more here and here). That, and there’s the fact that Hideo Kojima has appeared at the Famitsu Awards several times in the past when his games have won prizes. People like to have their work recognized! They like getting awards. Hideo Kojima is probably no exception. Here he is in 2006 at the Famitsu Awards 2005, picking up the award of excellence for Metal Gear Solid 3: Subsistence. Here he is in 2009 at the Famitsu Awards 2008, picking up a special Most Valuable Person award and an excellence award for Metal Gear Solid 4. And in 2011, at the Famitsu Awards 2010, once again getting an MVP award as well as an excellence award for Metal Gear Solid: Peace Walker. This time, things were different. Not only was Hideo Kojima absent, but nobody from Konami was able to pick up the awards. And this wasn’t just one award, but three. Surely, someone at Konami could’ve found a moment out of their schedule to pick up these awards, no? Here’s when Metal Gear Solid V: Ground Zeroes was given the award of excellence. And P.T. getting an award for innovation. 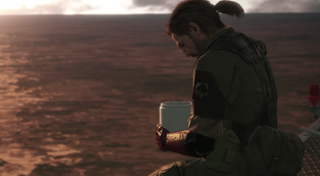 Finally, Metal Gear Solid got a “Game Media Award” from Famitsu and Dengeki. Again, nobody showed up to claim the award. The official Metal Gear Twitter account did tweet out several expressions of gratitude (here, for example), and Hideo Kojima did retweet these. However, Konami hasn’t offered an explanation as to why nobody connected to Metal Gear Solid or P.T. was in attendance. Once again, if this isn’t just strange happenings at Konami and a PR stunt, it’s a pretty mean one! Online in Japan, many game site commenters (here, for example) are writing that they think Konami is awful for this and wish Kojima could’ve been there to get these awards. Many people seem troubled by his absence. I’m sure there’s a good explanation for all that’s been happening. And this is just a terrible misunderstanding. Or perhaps, not. Toshi Nakamura contributed to this report.